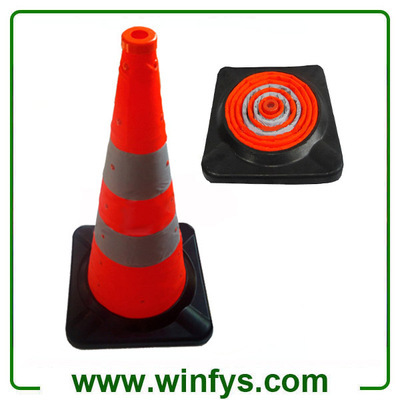 This Rubber Base Collapsible Traffic cones are used for caution/warning on hazardous areas, utility or road work,construction sites, parking lots and playground. At night, the reflective dazzling light make the drivers see it clearly.The collapsible rubber based traffic cone which can be easily collapsed for stow-away flatpack storage. Each one collapses down to just 60mm high. Very stable & lightweight due to low centre of gravity. Rubber base for stability & grip. Standard grade Prismatic reflective sleeves provide excellent nighttime visibility. Ideal for marking barriers and hazardous areas. Ideal in case of a vehicle breakdown. Collapsible Traffic Cones is lightweight & compact storage.